Start by planning out a design. Once you have confirmed on your design, apply glue to the rhinestone's back (only on the rims, depending on the rhinestone) to the first rhinestone at the very centre of the design and stick it to the case. Continue with the other rhinestones until your design is complete. Leave for at least an hour for the glue to set. Once the glue has dried, you can clean up any spilled glue with nail polish remover and a cotton bud. Voila! 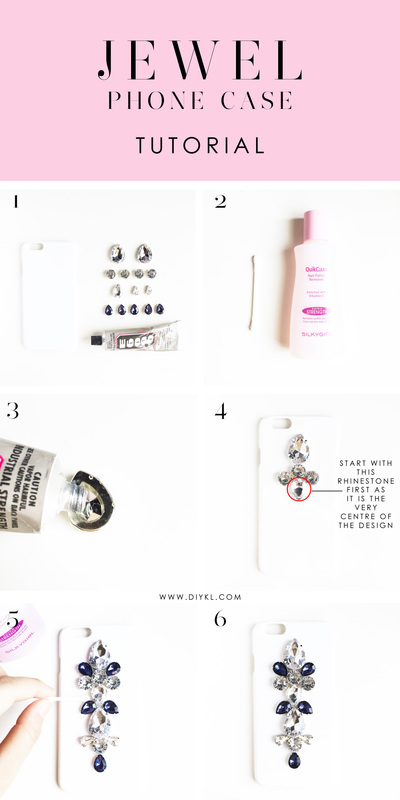 Your JEWEL phone case is done and use it to vamp up any outfit!